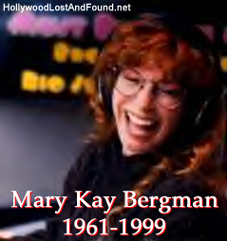 Mary Kay Bergman, born on June 5th, 1961, became one the most prolific and versatile voice artists during her 13 year career - performing in many commercials, animated feature films, and television cartoons. Her first voice job was in a radio commercial for a small home security company on a local radio station back in 1986. She would go on to perform voices for over 400 commercials, including Mrs. Butterworth's syrup (in which she provided the lead voice), Kellogg's, American Express, and Honda - just to name a few. From 1989, she was Disney's official voice for Snow White. She was probably best known for her versatility on the animated series "South Park," where (initially credited under the pseudonym Shannen Cassidy) she performed virtually all the female roles - including Mrs. Cartman, Stan's Mom, Kenny's Mom, Mayor McDaniels, Ms. Crabtree, and Principal Victoria. She also sang almost all the lead parts in the Oscar nominated song, "Blame Canada" in the film "South Park: Bigger, Longer & Uncut." In addition to Snow White, she performed many other voices for Disney - including one of the silly blonde girls falling over Gaston in "Beauty and the Beast," the ill-fated mother of Quasimodo in the opening of "The Hunchback of Notre Dame," one of the Ancestors in "Mulan," Jessie's yodeling voice in "Toy Story II," and Si the cat in "Lady and the Tramp II: Scamp's Adventure." She was the voice of Daphne in several new Scooby Doo movies, including "Scooby Doo on Zombie Island," "Scooby Doo and the Witch's Ghost," and the Cartoon Network parody, "The Scooby Doo Project." She played Barbara Gordon (and her alter-ego Batgirl) on the 1990's "Batman" animated series and in the video feature "Batman & Mr. Freeze: Subzero." Mary Kay also had a talent for doing voice matches for many performers, including Helen Hunt, Gillian Anderson, Jodie Foster, Meg Ryan, and even young male stars as Macaulay Culkin and Eli Marienthal. She supplied back up vocals in the song "Pretty Fly for a Rabbi" on 'Weird Al' Yankovic's album "Running with Scissors." "My idols were people like Carol Burnett, Gilda Radner, Tracey Ullman, Lucille Ball... comedic actresses who had chameleon-like qualities," she once said. Shortly before her death, Bergman was a nominee at the 27th Annual "Annie" Awards (which recognize achievement in animation) for her work as the voice of Sheila Broflovski in "South Park: Bigger, Longer & Uncut." Mary Kay Bergman took her own life on November 11th, 1999. She was 38.